I had a blast at the MREA Energy Fair! In case you aren’t familiar with it. 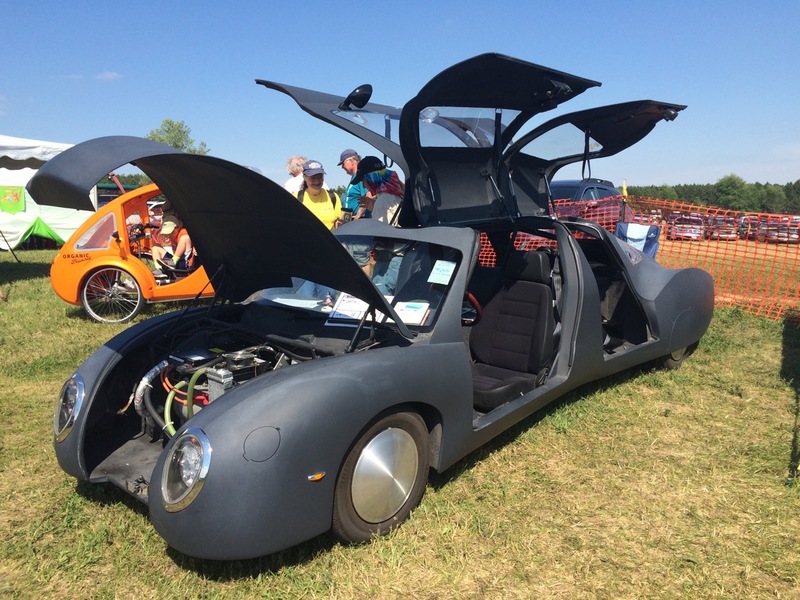 The Energy Fair is an event for renewable energy and sustainable living hosted by the Midwest Renewable Energy Association, in Custer, Wisconsin, on the weekend closest to the summer solstice. It’s one of the largest events of its kind in the country and focuses on EDUCATION with hundreds of presentations and workshops, plenty of exhibitors, and no shortage of fun, music, or beer. For me, the highlight of the event is the people. There are AMAZING people there! You can literally bump into any single person at the event, start to chat, end end up having one of the greatest conversations in your life… and then repeat with the next person you talk to. There’s always old regulars and new friends. 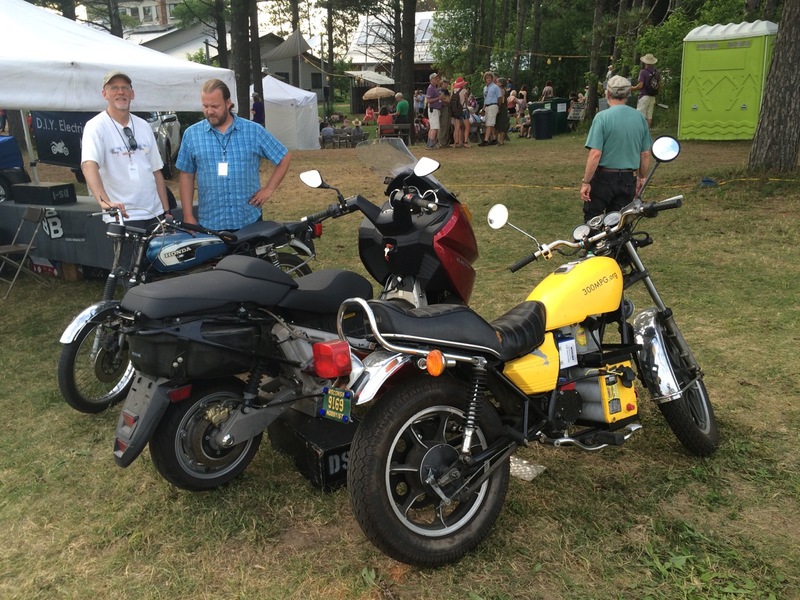 This year, I was especially excited to have a couple of electric motorcycle friends there. Ryland Erdman is a long-time Energy Fair volunteer and motorcycle rider. He was there showing off his home-built drive-shaft electric motorcycle. 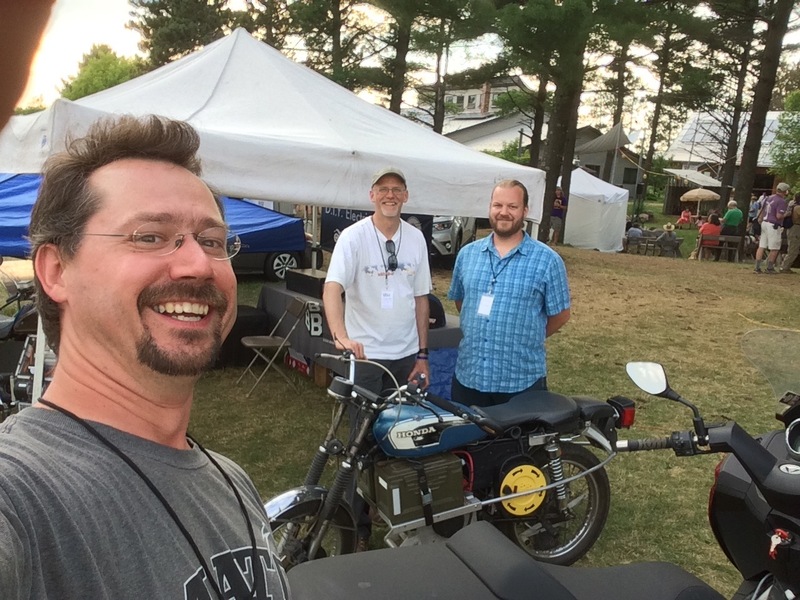 Our friend, Kraig Schultz, who I rode part of LOOP THE LAKE with, came on out from Michigan and brought his smaller electric motorcycle to show off. He’s a long-time cyclist with the heart of a hippie and the mind of an engineer. Kraig also brought a neat little portable display showing how electric vehicles work. Together, we hosted an extended 3-hour workshop on electric motorcycle design. 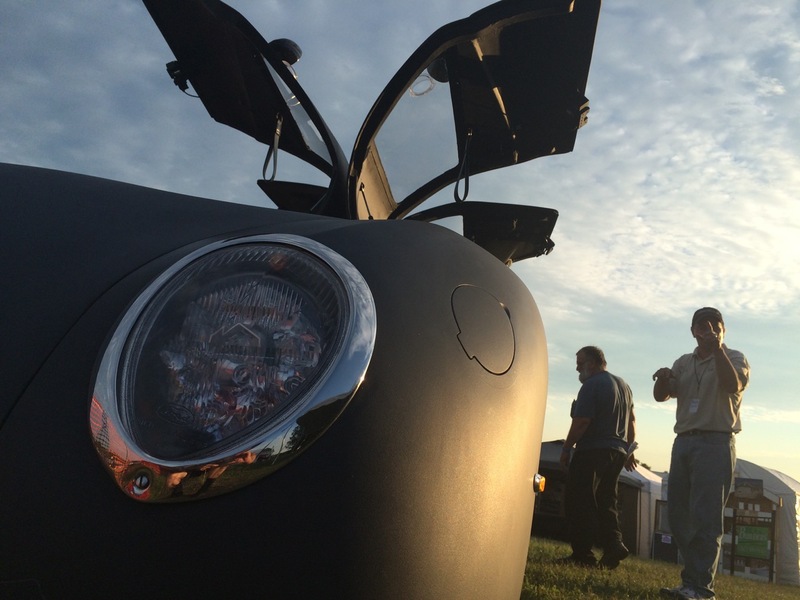 There were plenty of electric and alternatively-fueled vehicles at the Fair. I don’t think I’ve ever seen so many Mitsubishi iMiEVs together before. 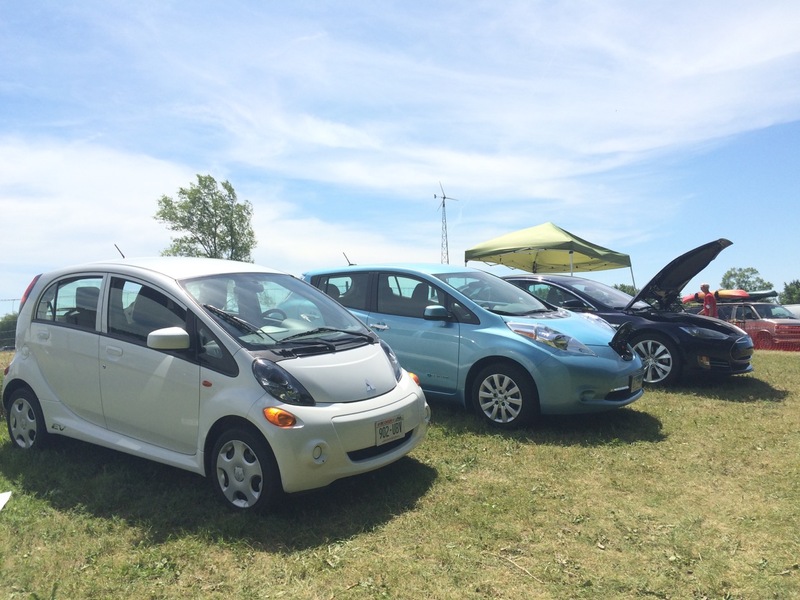 There were also Teslas, a Ford Focus Electric, C-max Energi and Fusion Energi, several 2nd Generation Chevy Volts, and enough Nissan Leafs that they were just parked general parking instead of being displayed. Of course, the creme-de-la-creme, was the Illuminati Motor Works “Seven” X-Prize Car. Kevin was kind enough to give us a ride in unique car. Nothing is quite as much fun as going 0 to 60 in six seconds on a side-road while facing backwards! 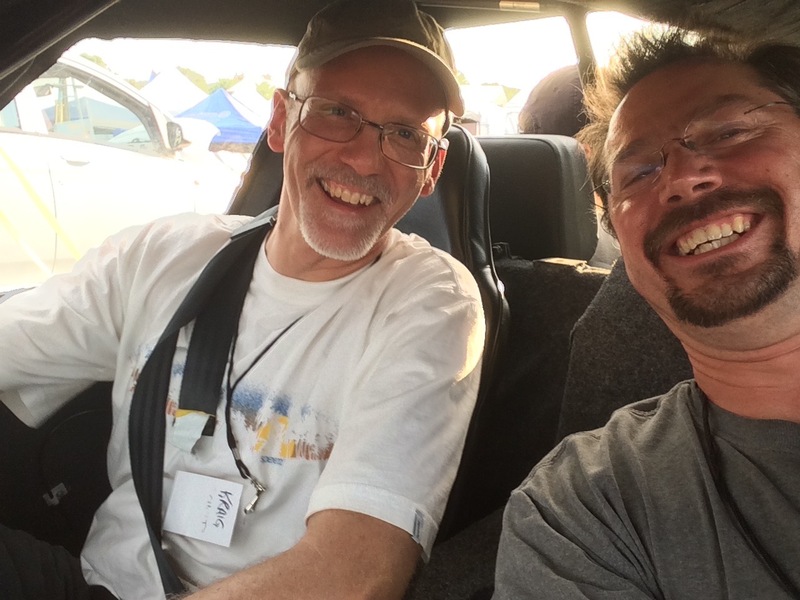 Kraig and I were in the back seats. Although I’ve had fun getting to test drive a Tesla, they feel almost pedestrian compared to this unique vehicle, which gets double the fuel economy of anything else on the road. I also got to speak with David Katz, who is doing some work repurposing Nissan Leaf batteries in home power backups, and Bob Rohr, a solar installer running the Caleffi booth. I actually worked with Bob a number of years back, producing the instruction DVD teaching people how to install Caleffi’s solar-hot water system kit. I briefly visited a couple of booths, looking specifically for more details on a racking system and inverters for my upcoming solar garage project. At the Iron Ridge booth, I got to play with some racking and learn about wind-force and snow loads. At a solar vendor next door, I was able to get two exhibitors debating back and forth on the merits of string inverters vs. micro inverters. I also bid in the silent auction for quite a bit of solar hot water equipment. The lot included pumps, valves, anti-freeze, pressure tanks, and a 3.5′ x 6′ solar hot water panel. I didn’t get the winning bid on that lot, but I DID win a Caleffi solar hot water system controller, with nobody bidding against me! The end of the fair is always bitter-sweet. It’s time to say good-bye to friends and pack up, but it’s also a time to start thinking about next year. So, what will next year bring? 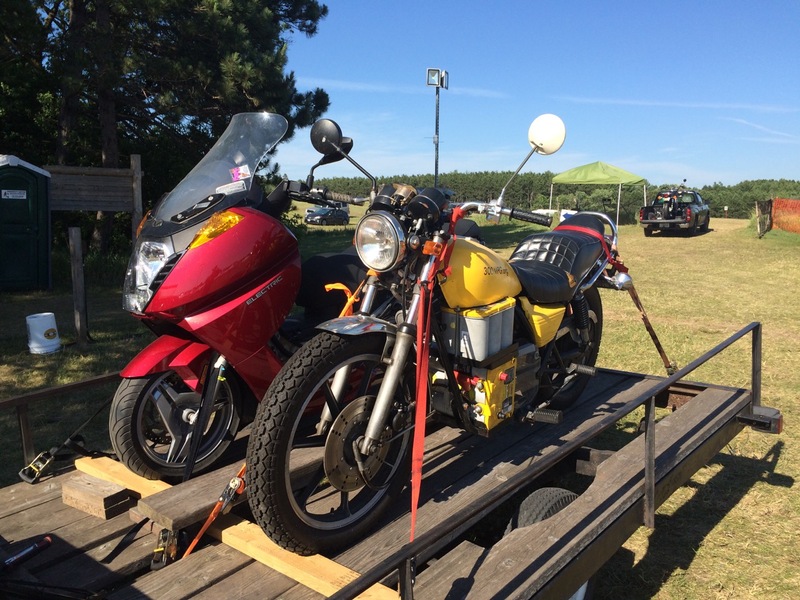 I don’t know yet, but I have toyed with the idea of building an electric motorcycle while AT the fair. Since I have a mini-bike frame around that I picked up at a rummage sale, perhaps that would make a nice and simple display to convert to electric at next years fair. Well, no matter what happens, I’ll see YOU at next year’s MREA Energy Fair!